In contrast to the hustle and bustle of Kuala Lumpur, or the luxuriant, expensive of neighboring country Singapore, Johor Bahru is a very peaceful city located in southern Malaysia. Johor Bahru impresses with its low roofs, spacious streets, and in particular the presence of some popular theme parks such as Little Big Club, Thomas Town, and Sanrio Hello Kitty Town. Each park has its theme and identity, which is an attractive destination for all family members. 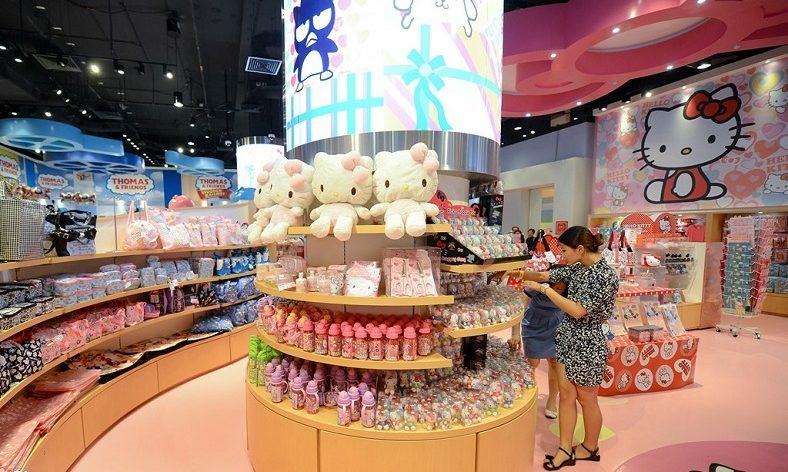 And the most impressive of these is the Sanrio Hello Kitty Town, Johor Bahru, where visitors have not only a memorable experience with the little angels but also the opportunity for adults to return to the happy kid’s world. Go over experiences that Sanrio Hello Kitty Town delightful Town will give you when coming to this beautiful land. Sanrio Hello Kitty Town opening in October 2012, is located at Puteri Harbor in the Nusajaya area, near the Legoland theme park in Johor Bahru, Malaysia. Sanrio Hello Kitty Town (also called Sanrio Hello Kitty Theme Park) is considered the first town of the Kitty cats outside of Japan. 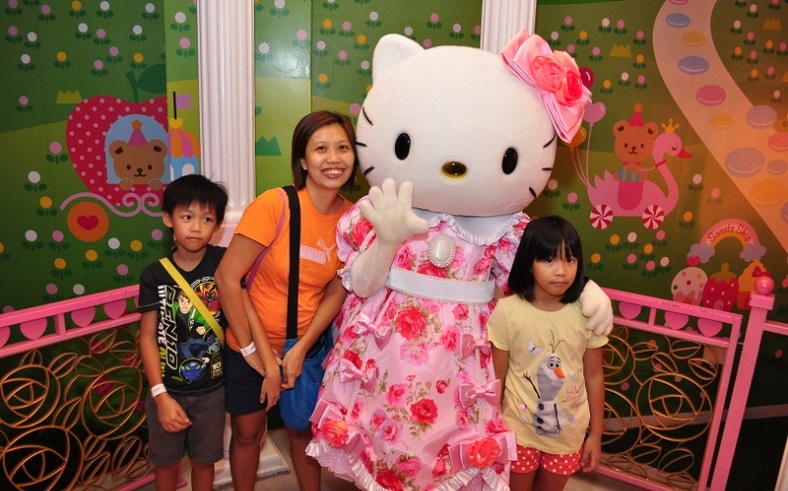 Sanrio Hello Kitty Theme Park is one of Malaysia’s exciting, colorful attractions for children, and families. Hello Kitty or Haro Kiti, whose full name is Kitty White, considered as one of the most popular cartoon characters in the country’s cherry blossom industry. Cats Hello Kitty is a fictional character designed by Yuko Shimizu. She was drawn in the shape of a Japanese tailfin cat and added a red ribbon to her head. To date, Hello Kitty has become internationally known, one of the representative images of Japan, which is also the product of the “kawaii” culture (cute) in the culture of entertainment. The entire park is designed and decorated in sweet pink tones, with an area of over 60,000 square meters. At Sanrio Hello Kitty Town, you will find many Hello Kitty cats appearing everywhere. That will be an excellent place for your children and your family to have an enjoyable holiday. In fact, the park originally opened primarily for children and sweet and gentle lovers. However, the park attracts hundreds or even thousands of tourists of different ages visiting on the annual weekend. 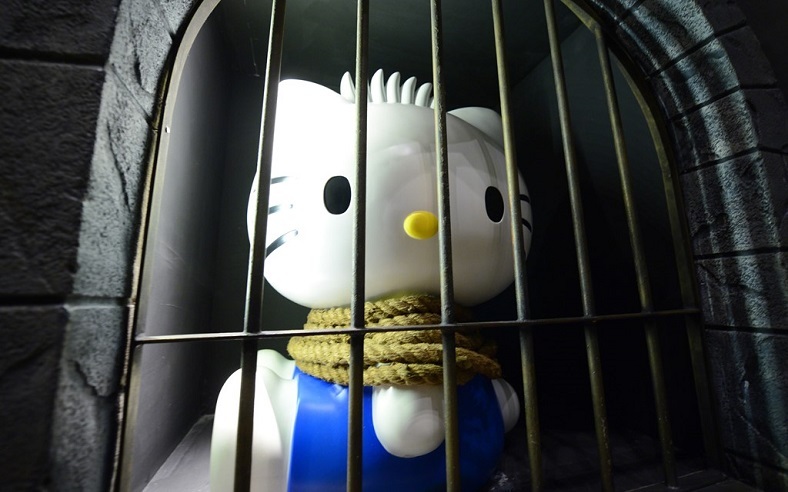 The town of Sanrio Hello Kitty in Johor Bahru, Malaysia has become a place of amusement and exchange for Hello Kitty fans with their different things to do with the beautiful white cat without a mouth and having a red bow. 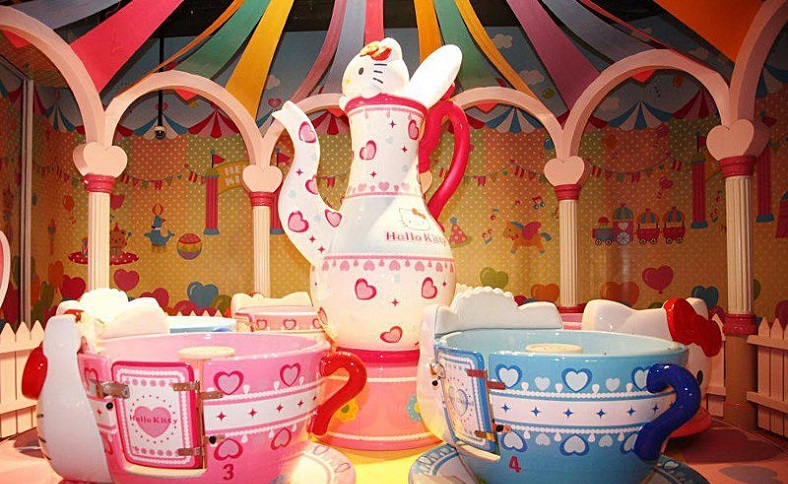 First and foremost, visiting Sanrio Hello Kitty Town, tourists will have the opportunity to explore the world of Kitty and immerse yourself in the lovely cartoon space at Kitty House. 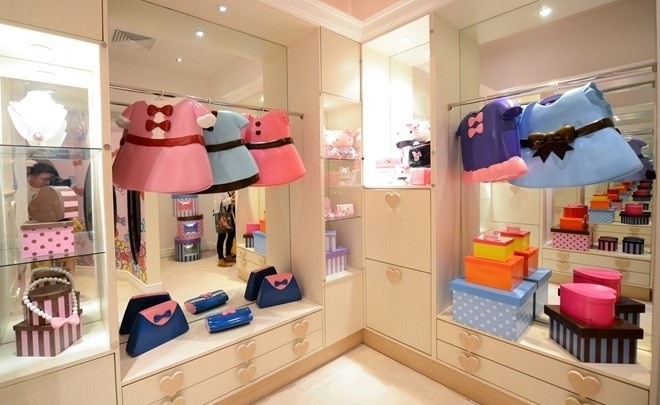 Iconic Hello Kitty house has perfect living room, bedroom, bathroom, kitchen and even a huge wardrobe with all decorated in Kitty-chic. Discover the interior of the house; visitors will admire the colorful “life” model of Kitty. All items such as clothing and bags, shoes are very attractive and lovely. They bear bold “style” of this cute pink cat. When you enter the bedroom, you cannot take your eyes off a large wardrobe with full of dresses brilliant of graceful Cat Kitty, next to the stream of beautiful and neatly arranged bags and shoes. Virtually everything is in pink, and it looks like candies. 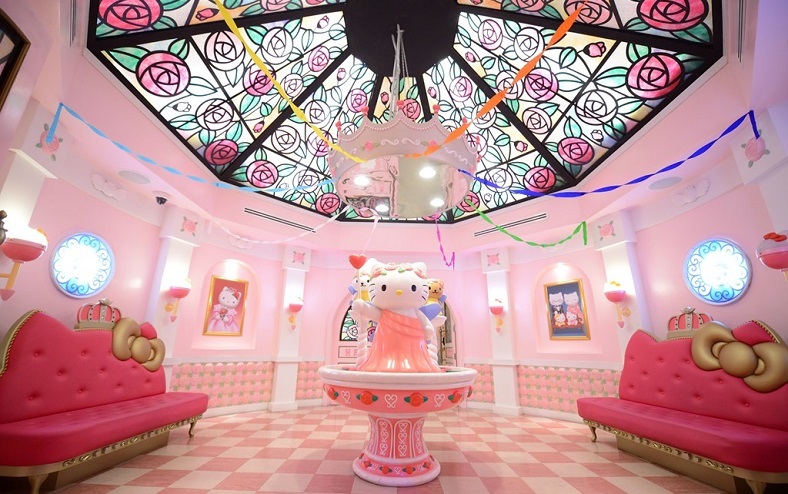 Many kids in the world who love Hello Kitty have the dream of having a beautiful room in their house that feels like this Kitty’s bedroom after visiting Sanrio Hello Kitty Town. In the next room is her kitchen designed quite spacious with yellow tones, and a full kitchen utensil. In the kitchen, visitors will see a set of spinning teacups in the windows. They also can take part in some exciting cooking activities such as making biscuits, decorating birthday cakes or drinking tea. Besides, when visiting the playroom, surely any child will scream in excitement when they can see, touching on the incredibly unique toys displayed here. There are some computer stations along the way with games to play. Also, kids will be watching Kitty’s beautiful piano at the corner of the playroom; or allowing to touch to the cute computer desk decorated with the image of Kitty cat. 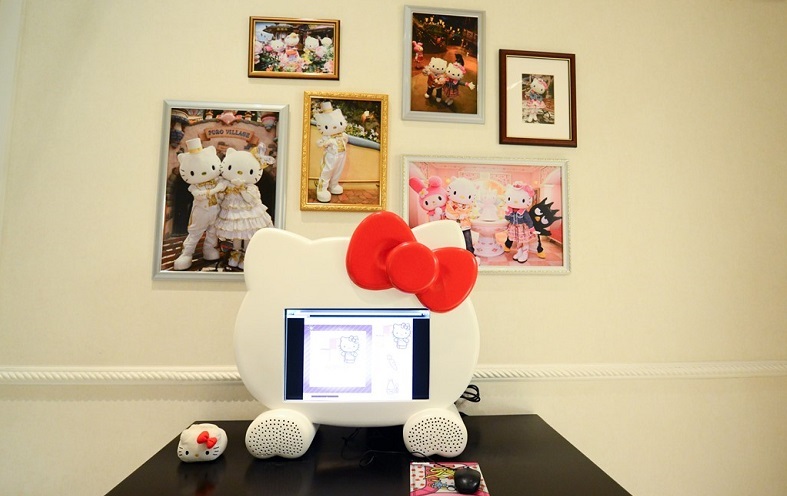 It may take a lot of time for you to explore Hello Kitty House at a leisurely pace. 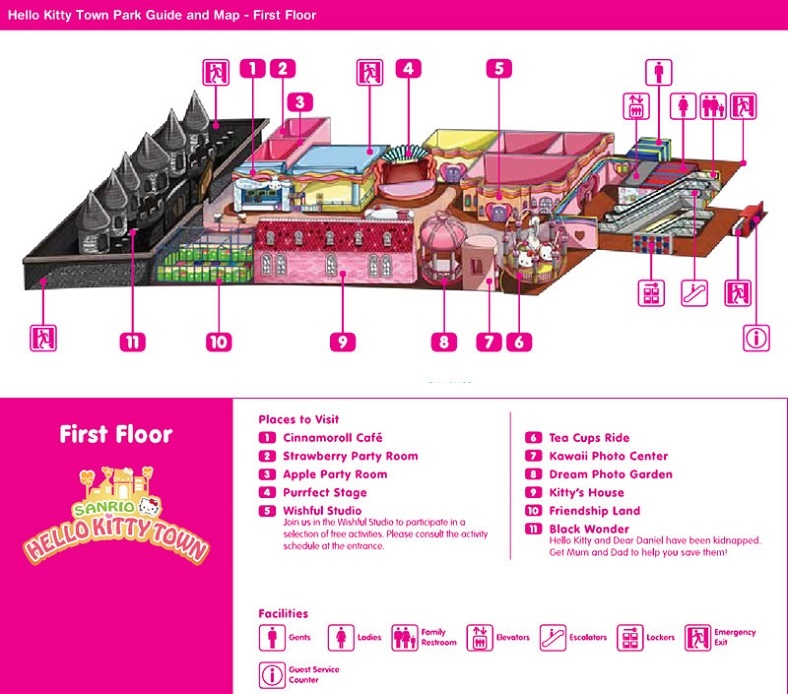 Hello Kitty Town is built with open spaces, including a wide variety of diverse, different outdoor entertainment venues such as restaurants, souvenir shops, amusement parks, mysterious forests. In each amusement park, many separate activities will be organized for visitors to participate in fixed time frames. Besides, the different Hello Kitty interactive games are very different for you to choose from in Black Wonder. For example, in Wishful Studio, there will have two sections with two activities in each part. The first section is you have to dress up the costumes and make a coaster. For dressing up, you can dress up as Hello Kitty, My Melody or Bad Batz Maru. Coaster making is quite time-consuming so plan your time carefully before participating this activity. In the other section, the activities are cookie decoration and badge making. The children enjoy the self-made button and the hand-made cakes in here. Also, visitors will play a puzzle game to save Kitty and his boyfriend Daniel, who is being held in a mysterious forest. 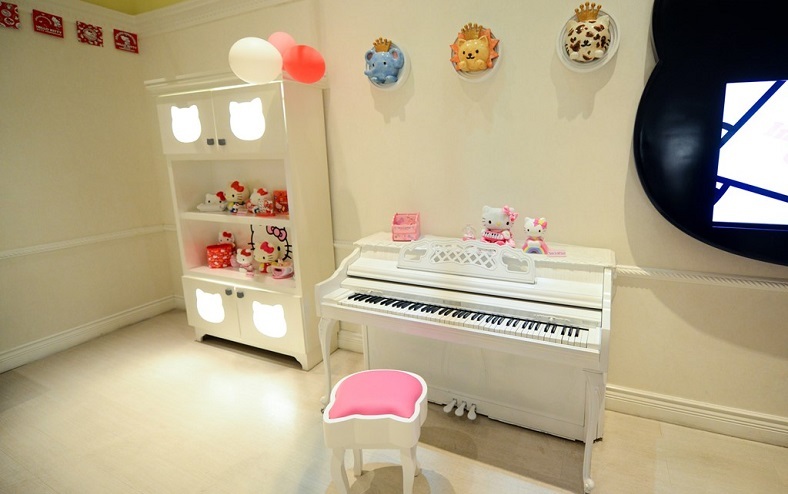 They can also watch elaborate art performances on the musical stage in Sanrio Hello Kitty Town. Of course, you do not forget to visit the souvenir shop here, which offers a lot of choices ranging from school supplies to fashion accessories and other premium items. Stepping into these colorful stalls, you will want to choose an item for your loved one. In particular, young girls love them since they not only have feminine, lovely color but also are very fashionable with Kitty’ style. There are little tables and chairs for kids to sit around while parents did their shopping. After hours of shopping, having fun, visitors can relax and eat at the chain of coffee shops such as Red Bow Cafe, Annie’s Culture Club, Project a Café, etc. 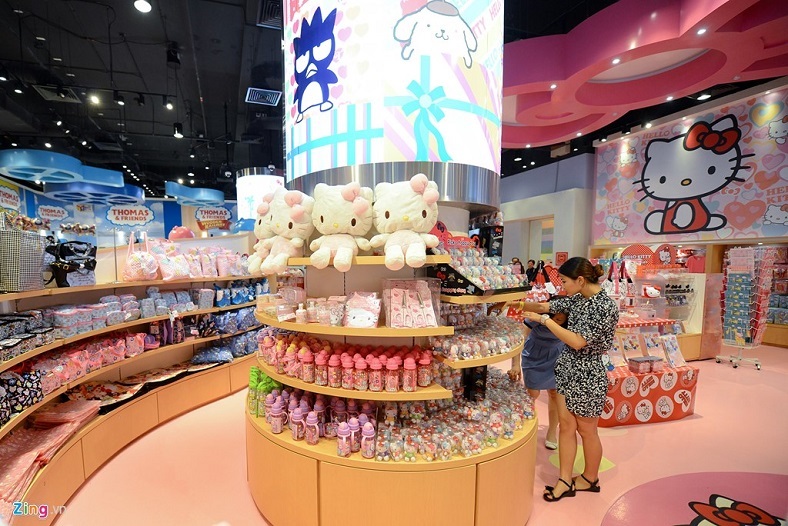 There are some things you should pay attention to when visiting Sanrio Hello Kitty Town, Johor Bahru that is compliant with no litter and no smoking regulations here. Because the park is enormous, the tourists come here need to conserve the landscape. 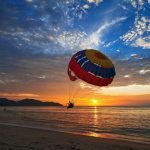 Also, since this destination attracts many children and women, pregnant women …, smoking can have adverse effects on the health of the population. 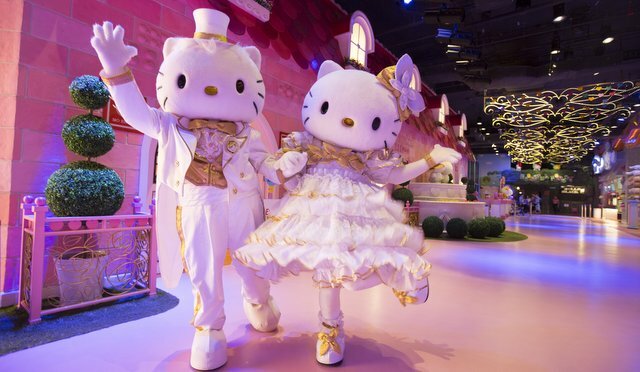 Hello Kitty Town is open from 10:00 am to 18:00 daily. The entrance fee is around RM 65 for adults and RM 50 for children. Tourists can visit home, join the game without paying any fees other than the ticket price. Johor Bahru is emerging with the most amusement park in Southeast Asia. Each park is built in a very personal style and fascinating. 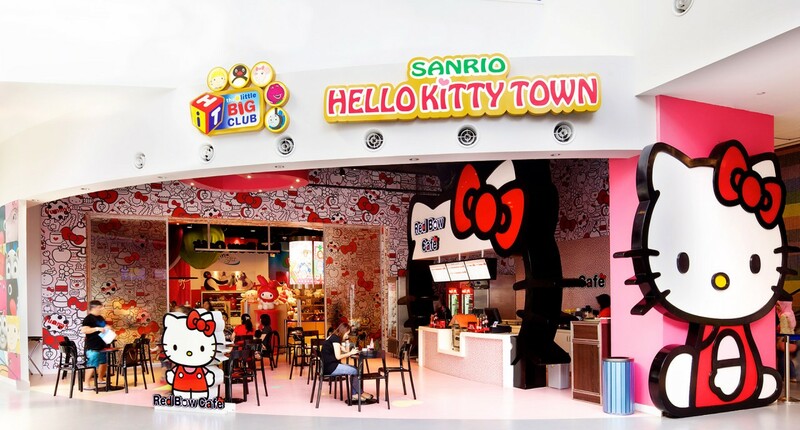 Sanrio Hello Kitty Town not only gives Johor Bahru a very personal style, different from other tourist attractions but also becomes one of the most exciting and colorful tourist destinations that attract scores of visitors to Malaysia, especially young travelers. You and your family should visit this place for fun and joyful moments. The place is a unique gift you should give to your lovely children in a special day. 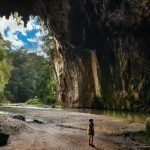 Visit the cute Kitty Cat Town in Johor Bahru Malaysia by booking your plane ticket to Malaysia for your next trip; you will have a great experience!